This research would not have been possible without the efforts of the writers or artists themselves. Every attempt has been made to credit their work where possible. This body of images is by no means a definitive collection of contemporary urban art or writing practices, but rather representative of what has taken place over the course of this research, and what I been able to observe and capture in this transitory urban landscape. This research is situated within a broader capture and rich visual fabric of existing and ongoing documentation of graffiti writing and urban art in Sydney’s inner suburbs. 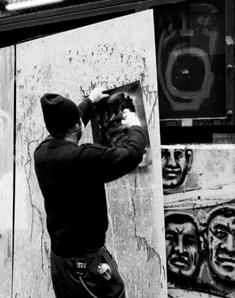 I acknowledge the contribution made by artists, ‘graphofiles’, urban explorers, graffiti photographers and an online community of contributors, such as Colin Hubert (aka Godot) who has been recording Sydney’s street art from the front seat of his taxi, as well as Konsumterra, a self professed political artist, who is at the forefront of urban art education. A special thanks to my friends in the graff community for taking me on a journey through some of the more hidden spaces and traces captured here. I would also like to thank my friend Phillip Sage for helping me with the video, directing the shoot and editing the footage. A comprehensive list of graffiti writing and urban art websites and personal blogs can be accessed from the Sydney Graffiti Archive Blog site.